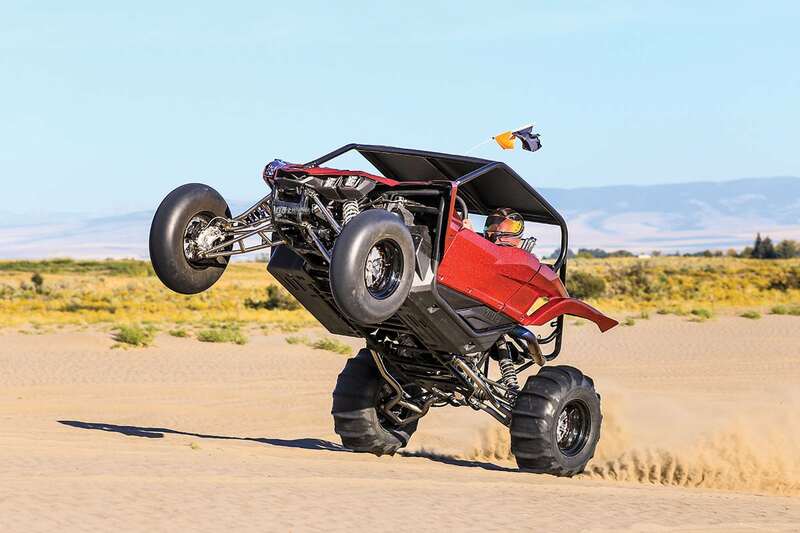 Massive power wheelies are not an aberration with this Packard YXZ. It easily lifts the front under acceleration. This is in third gear! No matter what generation you are from, the older generation is always complaining that the next generation is being contrary. Some youth follow in their father’s footsteps, while others want to do exactly the opposite of what the family expects of them. Famed turbocharger and supercharger hop-up specialists Packard Performance did both at the same time. The Packard brothers Jace and Jedd (we sense a pattern here) are the muscle behind Packard Performance. They grew up with father Dennis Packard of Packard Enterprises Racing (PER). PER is a long-time, mostly two-stroke tuning company specializing in quads and snowmobiles. 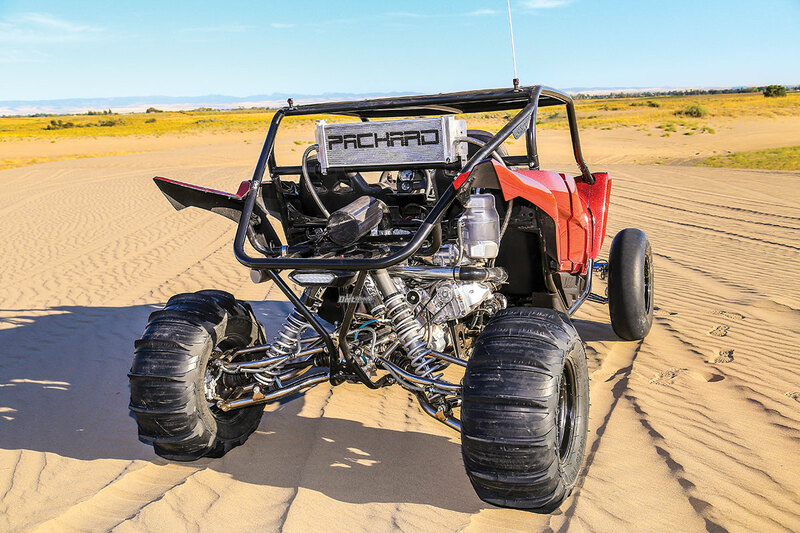 Packard Performance has been primarily in the UTV market since shortly after the introduction of the Yamaha Rhino. While Dad specialized in two-stroke tuning, the sons are solidly in the four-stroke camp. Packard’s early turbo kits were known for being affordable. From those early beginnings, Packard Performance has grown a much larger footprint in the UTV market. Instead of helping single-cylinder UTVs and push-rod Polaris 800s get out of their own way, Packard builds some of the hardest-accelerating UTVs there are. Like any YXZ, the Packard machine turns nicely, but as soon as the combination turbocharger and supercharger hit boost it somewhat just launches off in the direction the rear wheels are pointing. The smooth candy red paint over giant Bass-boat metal-flake makes the car truly stand out without using flashy graphic treatments. The feather-light wheels catch immediate attention, but look closely and you see many amazingly trick details on this car. 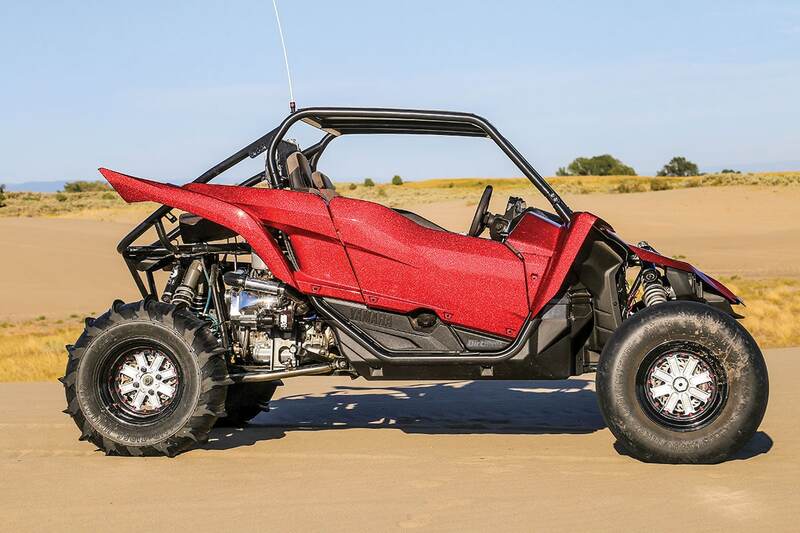 When we saw this Candy Metal Flake Red missile at the Arm Drop Sand Drags at Idaho Dunes in St. Anthony, Idaho, we assumed that this was a rolling catalog for the company; an impractical dream machine that nobody would actually buy. Color us wrong. This is the plainer, more practical of the two Yamaha YXZ1000s that Jeremy Herron owns. This one has 550 horsepower, but the other has the frame stretched 10 inches, and it is even faster! The owner tried to dump all the weight possible including the front diff and axles, but he did opt for race seats and race seat belts. It would be safe to say that a stock Yamaha YXZ 1000 makes in the neighborhood of 125 horsepower. This Packard Performance YXZ is still 999cc like a stock one, but it manages to live making 550 horsepower! The key to making the power is forced induction. You can force induction, in other words pressurize the intake side of the engine, in two common ways. One way is with a mechanical supercharger that uses power from the engine to rotate the compressor, usually via a belt. The other way is a turbocharger that uses exhaust pressure to spin a turbine-type compressor. Or, you can go nuts like Mr. Herron and use both. 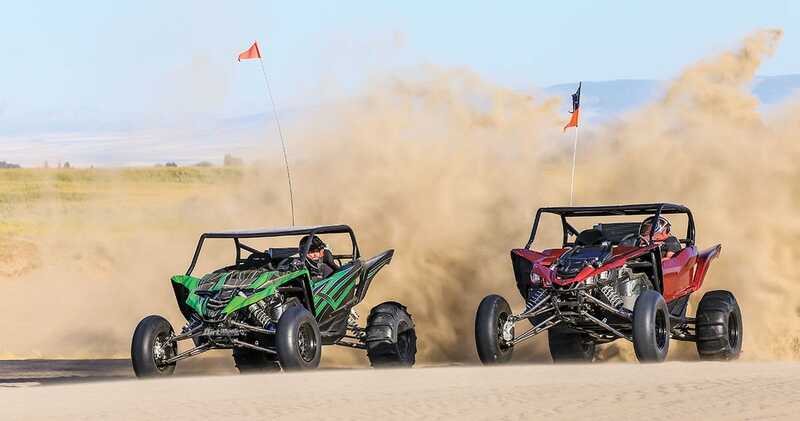 In the case of the Yamaha YXZ engine, a supercharger or a turbocharger significantly boosts the power, but the Packard supercharger is said to boost the low- and middle-rpm drivability more than the turbocharger. In general, the greater the boost to the engine, the greater the power output. In this case, one compressor is feeding the other compressed air and fuel, so the boost levels are high. As we said, more boost equals more power. The problem is that more power means more heat and greater strain on every part of the engine. In the interest of longevity, the stock crankshaft gets stronger rods topped by pistons up to the increased combustion pressure. Partly for longevity, but also to make the engine handle the boost efficiently, the head is ported, and bigger valves and high-performance cams are added. Naturally, the big valves get new springs and buckets. All of the engine mods are part of the Packard Stage 3 engine package. The entire fuel system must be upgraded from the pump, lines, fuel rail, regulator and even the injectors to keep up with the boost, but those parts are included with the kits. Mixing the turbo and the blower kits require additional parts and tuning. Herron also upgraded to a twin-rotor supercharger. The extra tuning and the supercharger upgrade boost the power, but also boosts the price $3000 above the cost of the engine kit, clutch and the two induction kits. Packard’s quick shifter looks cool, but it shortens the shift throw, and it has a launch-control button integrated into it. Packard claims that engine longevity is actually pretty robust, and it’s the rest of the drivetrain that requires care and attention. To begin with, Packard runs a complete Barnett clutch. The Barnett setup is quite affordable. At these power levels, the front differential and driveshaft are deleted. The rear driveshaft is fabricated from chromoly, and it is connected to a billet-aluminum rear diff with upgraded bearings and OEM gears. Connecting the diff to the uber-light Packard wheels are Turner Cycles Eagle level 3 axles. Even then, Packard stresses that care must be taken to ensure that all of the driveline components are kept in top shape. In too many cases more mods mean more weight. Weight is the enemy of performance. Beginning with the Packard wheels and Sand Tires Unlimited tires, it is clear that Packard is all about weight savings. Jeremy Herron is even more of a weight watcher. All of the bed parts are discarded and left in the same parts pile as the front-drive parts. Some parts just have to stay on the car, so he changed the material where possible. The long-travel suspension kit from NSX Designs is crafted from titanium for a 60-pound weight savings! The Rebel Style Kustoms cage is lower than stock and crafted from chromoly tubing for more weight savings. 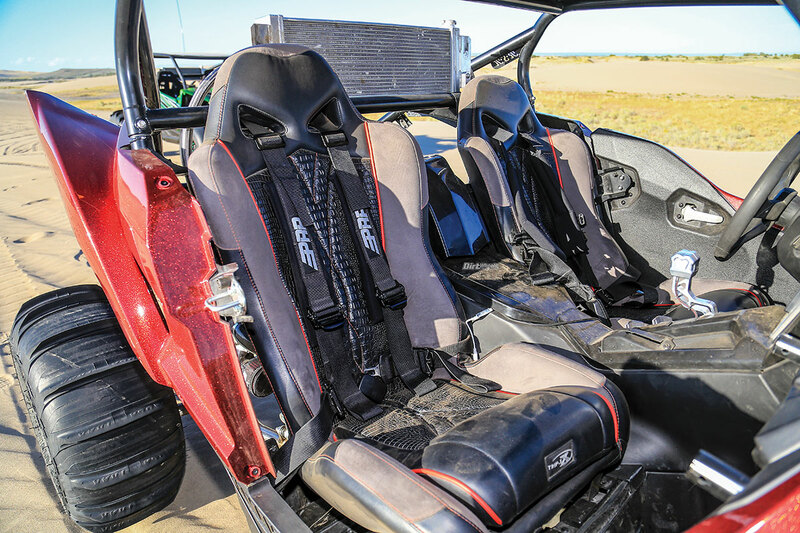 Some weight is simply required, so the seats are from Triple X with PRP harnesses. Trust us, on a car this fast, you won’t begrudge a cent spent on safety. There are also a variety of billet parts in the cab. One of those is the Packard shifter with 30-percent-shorter throw and a built-in anti-lag launch button for racing starts. This is one way to make a performance intake: have machines whittle it out of blocks of aluminum! It is a slick piece that boosts power. The turbocharger feeds into the mechanical (upgraded to twin-rotor) supercharger. 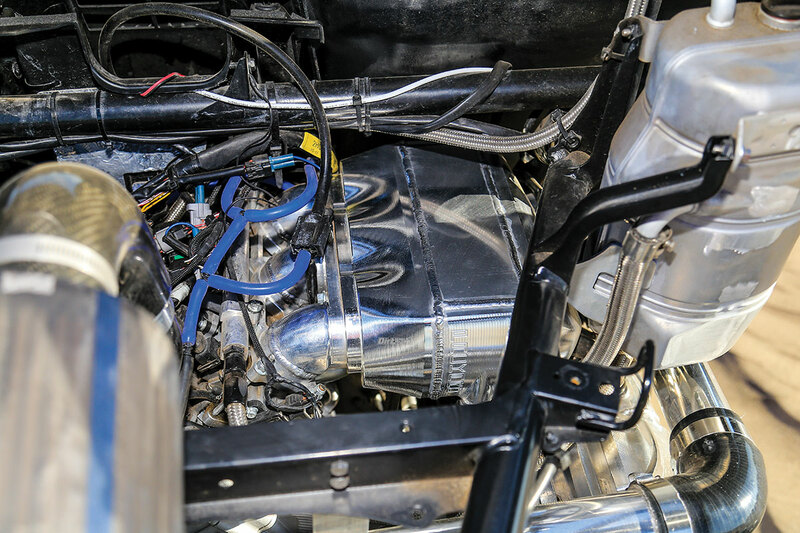 The YXZ is a dry-sump engine, so the tank above the intake holds the engine oil. 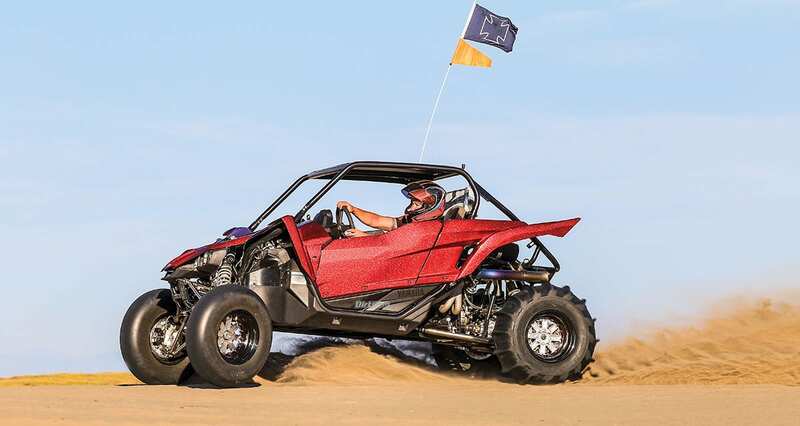 By the time we went out in Herron’s YXZ, the car had been subjected to some serious hill-shooting during the drags, as well as plenty of dune blasting. While this car did finish second in the laid-back drags that just happened to pop up at the same time as the UTV Invasion, this is Herron’s general-purpose car. We wanted to go easy on it, and the race fuel it demands was in short supply, so we stayed in the smaller dunes near camp. The problem is that this car swallows small dunes like Popeye gulps spinach. This is clearly the business end of the car. Massive intercooler, belt-driven supercharger, titanium long-travel suspension and other go-fast goodies abound. There is one other significant issue. In second and third gear, this Yamaha stands straight up in a power wheelie. It doesn’t just bounce the wheels up for a second. 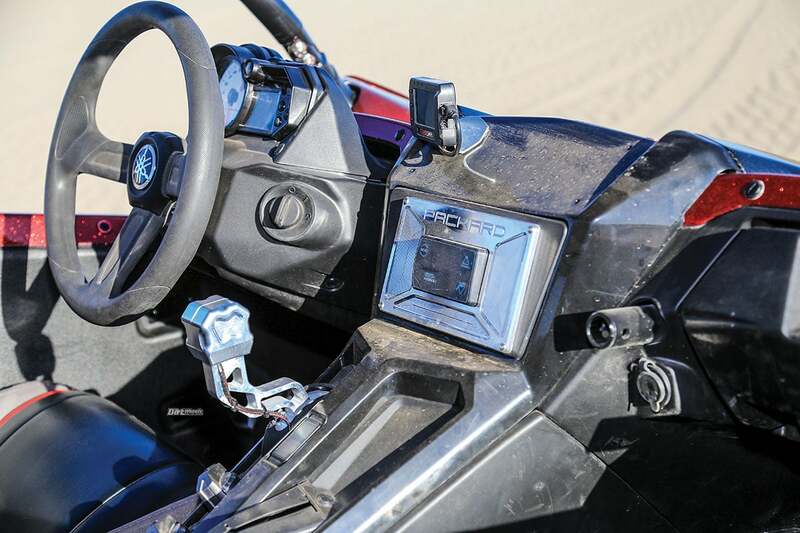 It lifts the front high, and the driver controls the balance with the throttle, just like doing a wheelie on a manual-transmission sport quad. It wasn’t actually as terrifying as we thought it would be being in the car as it clawed for the sky, but we could envision the car running out of dune during a wheelie and launching out into space. There isn’t a lot of bottom power, and you sort of listen to the rpm building while you scrunch in anticipation. Then the boost arrives and you get slammed in the seat like nothing you have ever felt. Then the problem is to shift before the tach needle light-sabers the redline. As long as you keep shifting, the acceleration literally takes your breath away, and then the front wheels are so high you are looking at the floorboards with no clue where the car is unless you can judge by looking out the sides of the car. The red car is one of two that the owner has. The green one is even faster. It is stretched 10 inches, so it launches harder and keeps the front end down. Herron and the Packards may call this a general-purpose dune car, but for most people this YXZ would be the biggest thrill of their life. If you aren’t used to it, the acceleration literally messes with your grip on reality. If you don’t crave power and speed, one ride could trigger post-traumatic stress syndrome. Our normal grins that come with any horsepower fix developed fear wrinkles. That was without jumps and hitting whoops or dropping into bowls. We were on mostly flat, smooth sand. Forced induction apparently boosts a machine’s power and the human occupants’ adrenaline output to critical levels.